Meet our newest &FL bride Megan! 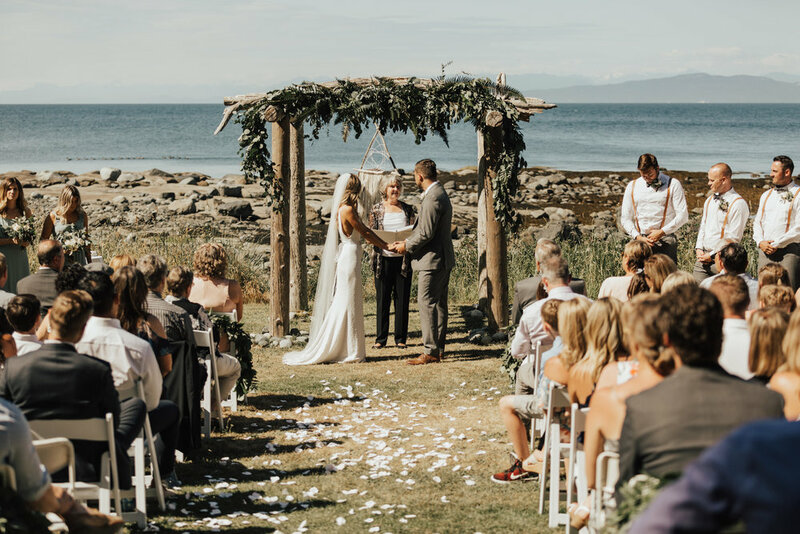 This Canadian bombshell of a babe married the love of her life, Jamie, on the Island of Hornby near Vancouver in BC, right on Canada Day. 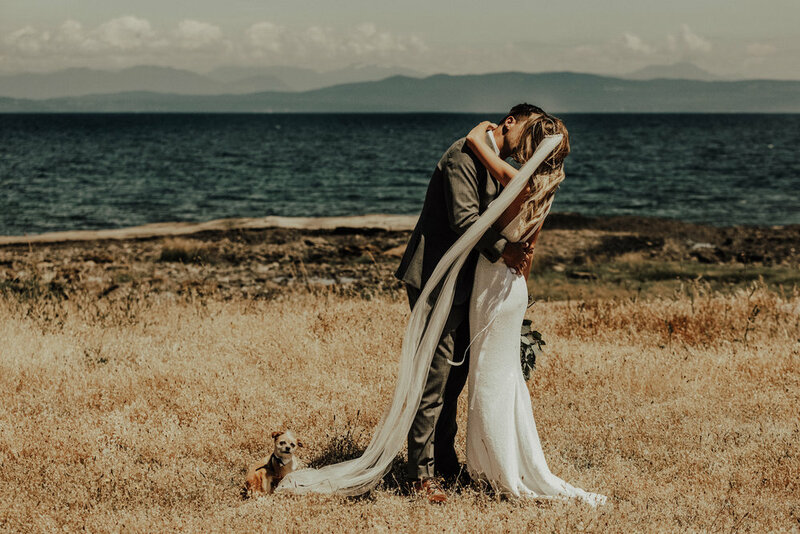 Megan totally encapsulates the &FL spirit - especially as she customized our fave sequined BROOKLYN gown with a gorgeous belt and super long veil and Bo+Luca headpeice, all from our Vancouver retailer Rituals of Love Bridal. 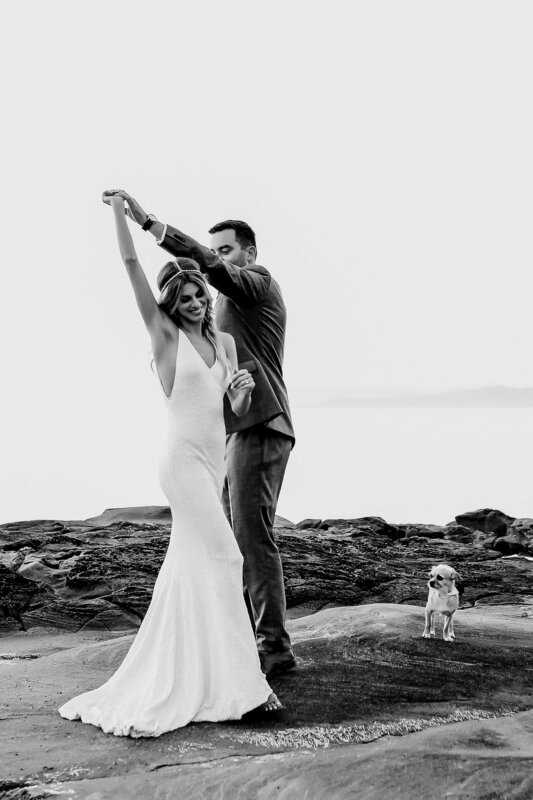 We're head over heels for this lovely couple! And can we mention how much we love the family pictures with their dog?! Dress: & FOR LOVE "Brooklyn"
What made you fall in love with your dress? I loved the simplicity of the dress and the feeling I had when I put it on. It was totally unexpected. I never pictured myself in sequins because I always thought my dress would be lace; however, the second I tried on the dress I knew it was the one. Both my mom and I were in tears and I just felt so comfortable in it, I didn’t want to take it off! Boho Feminine if that’s a thing? A part of me loves to be girly, but I also have a more natural, bohemian side! I loved how the dress, headpiece and veil combined both. Jamie is the nicest, most genuine person I’ve ever met. He’s the kind of person who stops and helps people carry their groceries or buy a homeless person a meal, he truly cares about others, it actually makes my heart melt! On top of that he’s incredibly handsome, smart and has a lot of the same values a close-knit family, loves to travel, and shares my curiosity for trying new things and new experiences. I knew he was one when he met my family. I have two older brothers that mean the world to me who had not liked either of my ex-boyfriends (looking back I don’t blame them) and seeing them get along so well and grow to become good friends had me envisioning what our life when as we grew old together, I knew I’d be lucky to have this guy by my side for life. I was inspired by the venue and the island of Hornby. It is one of the most beautiful places I’ve ever been to, so I really wanted to keep it simple and let the natural beauty come through. We did minimal décor, and opted for a lot of greenery for majority of our decorations. It’s a bit of a hippy island so we wanted to have a casual but still elegant vibe. Our goal was just to have a relaxed wedding where everyone could have a great time and celebrate with us! Hard to sum it up in one thing. 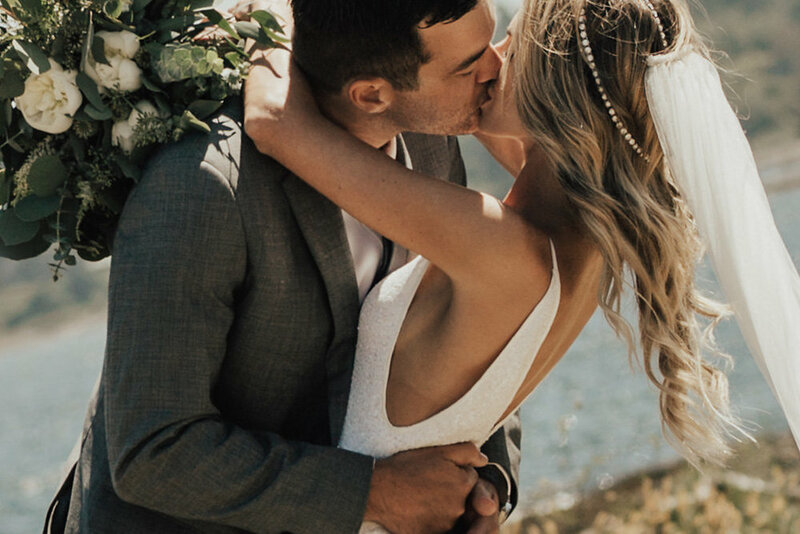 I loved our first look, seeing him for the first time was one of the best moments of my life. Also, the ceremony. We wrote our own vows and sharing our promises and love for one another in front of our friends and family was so special. Honestly everything about our wedding day was my favourite. Yes, there was a surprise! When Jamie proposed during our yearly camping trip in Tofino, my amazing brothers brought fireworks and set them off the night of our engagement in front of a full beach of campfires. I actually didn’t believe it was them lighting them off. I was so blown away by these two - what a way to celebrate! Anyway, fast forward to our wedding. At 11pm it hadn’t even crossed my mind that they would do something like this again, but they did and this time it was an even bigger display (some of our guests thought they were Canada Day fireworks). The week before the wedding they drove 2 hours out of the city to make these fireworks happen. Seeing them walk up after in their safety goggles and suits was one of my favorite moments from the day.